this is so lovely! that blue is the perfect shade on you. gorgeous background too. such a cute look, and i LOVE that bag!! man you have wicked lovely hair! i have been called moptop in my time as well! i used to hate curly hair when i was younger but now i wouldn't trade it! i am so in love with this royal blue dress! 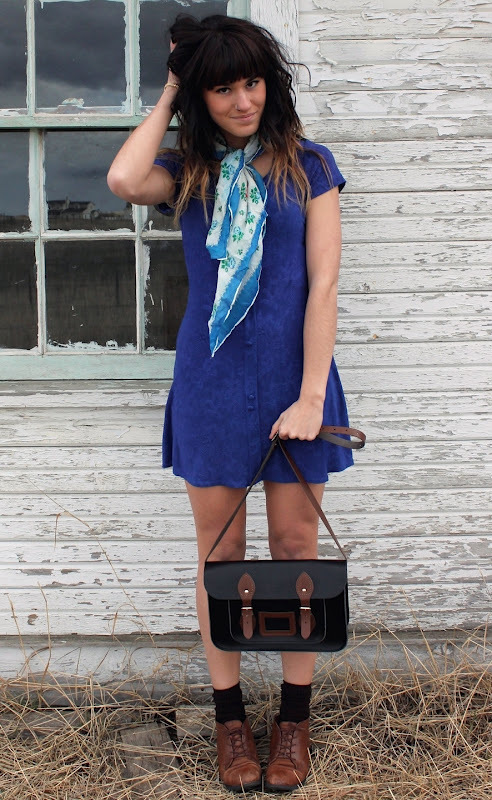 i think a vintage scarf classy's up any outfit perfectly. love the color of this dress, it really suits you! 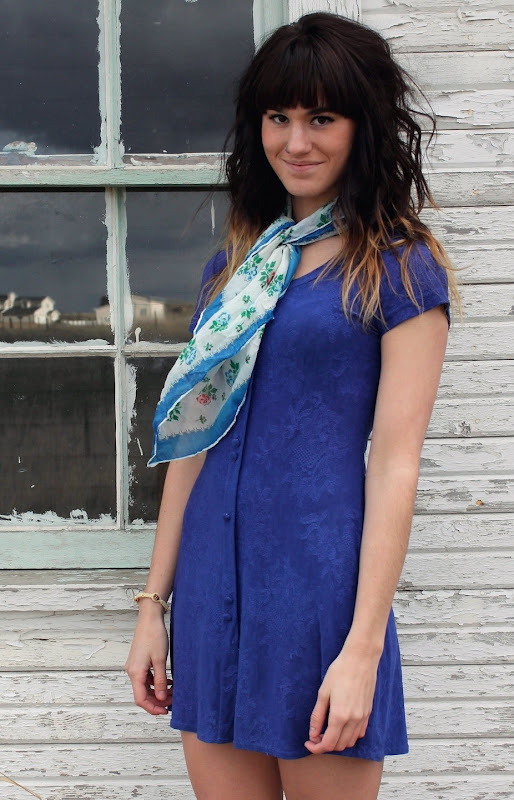 The dress is so lovely, and the scarf gives it a retro feel, the color suits you so well! You look lovely! The shoes and dress are to die for. I love your locks to! Haha, love the neck scarf too! 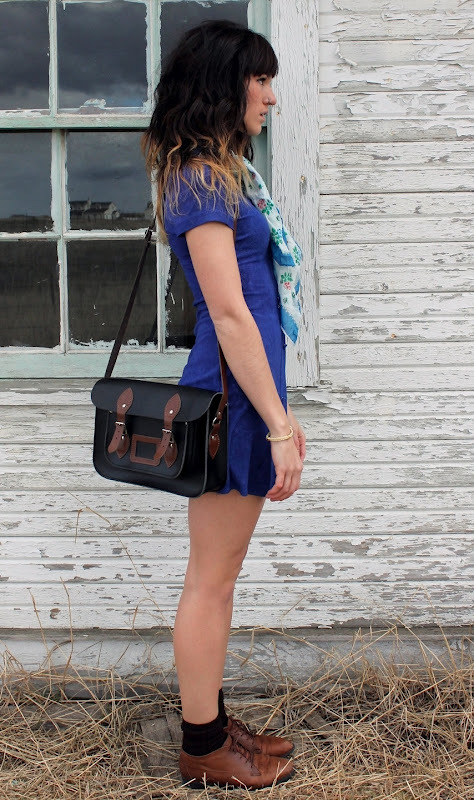 And oh man...I seriously love the Leather Satchel Co. bags! 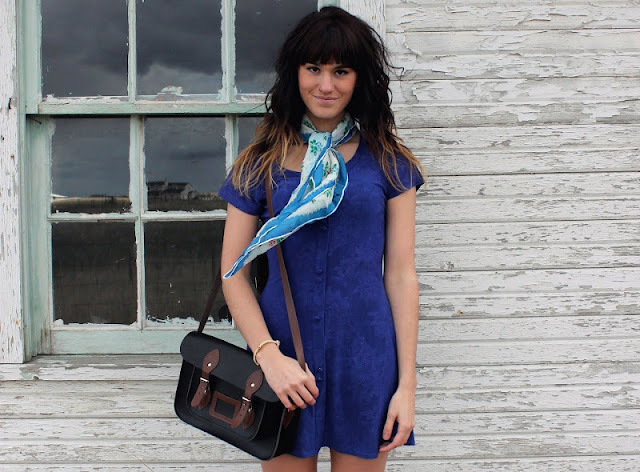 Love that blue color and your ombre hair! LOVE the dress so pretty such a fantastic colour too! love the color of this dress, and the bag oooh the bag is pretty! I love the vintage aspect of this dress, i'd would never have thought to style it with brown shoes and black socks but it really enhances the whole outfit. That dress is beautiful, love the color! But yout bag is the best!! adorable outfit, love that dress! Love the outfit, especially those shoes! I often find pretty scarves while thrifting then back out of getting them cause I don't know how to wear them. Love this combination though. I will have to buy some and try it! You look beautiful, as always.. The dress is lovely and you look amazing, beautiful and your hair is fab ! I love love love your hair! Are you naturally wavy? Love that bag! Too cute.